I am a huge fan of the prepared foods bar at Whole Foods. There is no place else I can think of that you have access to so many amazing foods in a one stop shop. There is also no other place I can think of where I can easily spend $30-40 for a single carton of food. I like to fill up my cardboard container with everything – from the hummus to the curried vegetables to the salad bar, I love to try it all. 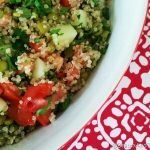 During my last few visits to Whole Foods I have seen a Tabbouleh Salad on the prepared foods bar, only made with lentil and quinoa instead of bulgur wheat. I love the variation so much I decided to make it at home. 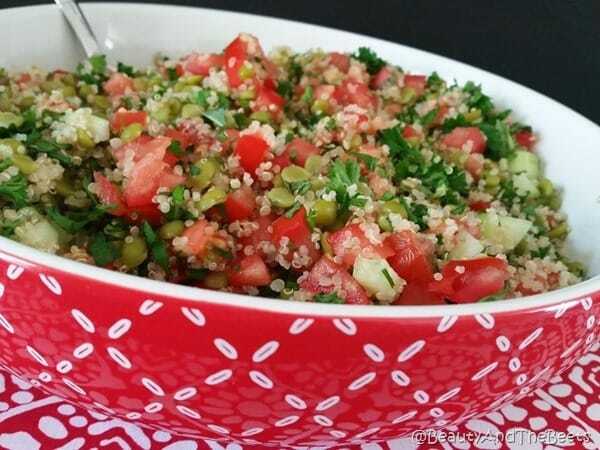 Tabbouleh, tabouli and tabouleh (all the correct spelling and interchangeable) is traditionally a vegetarian dish in Middle Eastern cuisine, usually as an accompaniment to a larger dish or meal. However, in using both lentils and quinoa, this version can stand on its own as a main course. To me the star of the dish is the parsley. While normally used as just a garnish, parsley can lend a spicy and fresh flavor when used as an ingredient. Parsley is an excellent of vitamin K and vitamin C as well as a good source of vitamin A, folate and iron, all essential nutrients for optimal health. Other common ingredients in traditional tabbouleh include mint, tomatoes and onion. In this case I used green onion as to not overpower the other flavors. I also added cucumber for a little more substance. I also added garlic to lemon juice and olive oil as a dressing to toss the ingredients in. The dish is light and airy enough for a summer barbeque, but also hearty and filling enough to warm you up on a chilly fall evening. 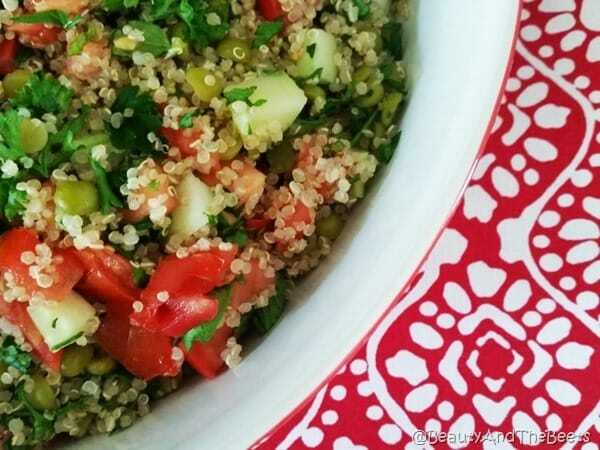 Enjoy this Lentil Quinoa Tabbouleh! 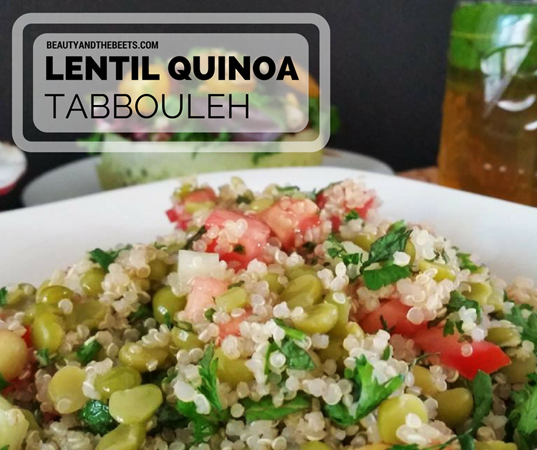 A tasty and healthy variation of a traditional tabbouoleh dish. 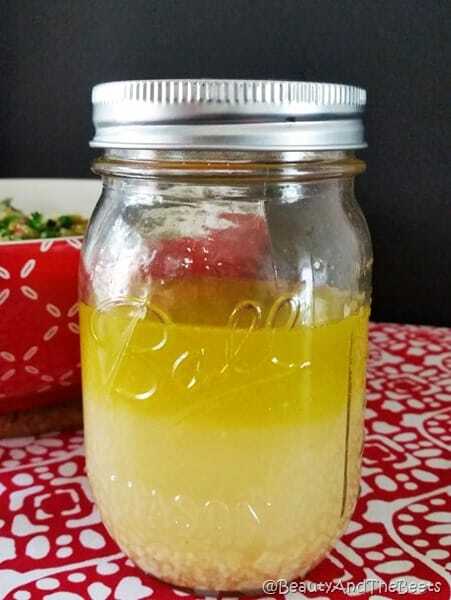 Combine the olive oil, lemon juice and garlic in an airtight jar. Shake until well blended. Set aside. Add the lentils, quinoa, tomato, cucumber, parsley, green onions and fresh mint into a serving bowl and mix together with a spoon. Drizzle the lemon juice mixture over the lentil mixture until the salad is lightly dressed.